The 4,000-acre Topock Marsh was created from a historical river meander in 1966 when the South Dike outlet structure was constructed. 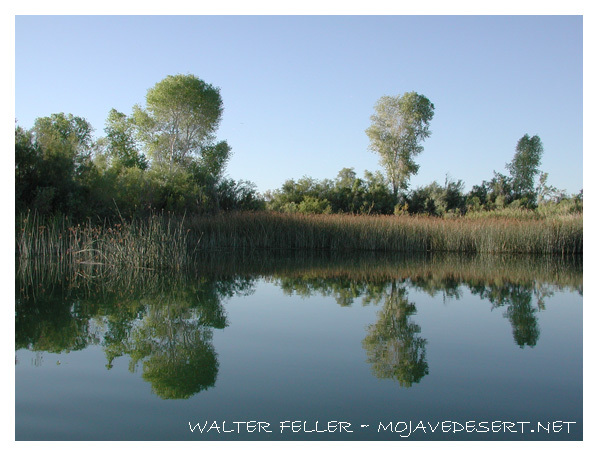 Presently, the marsh represents over 40% of the remaining backwaters of the Colorado River. The marsh serves as a critical resting place for migratory waterfowl and a home to resident songbirds, waterbirds, and other wildlife. Each year, thousands of visitors launch their boats to explore Topock Marsh. You will find excellent canoeing, fishing, and waterbird watching. The 4,000-acre Topock Marsh depends on water from the Colorado River, as do metropolitan areas as far as 300 miles away. Managing water flows to assure the best levels for waterfowl and shorebirds takes constant monitoring and coordination. At the northern end of Topock Marsh, you will find refuge croplands growing in the Pintail Slough Management Unit. Waterfowl feast on the wheat, millet, and natural plants during the winter months. 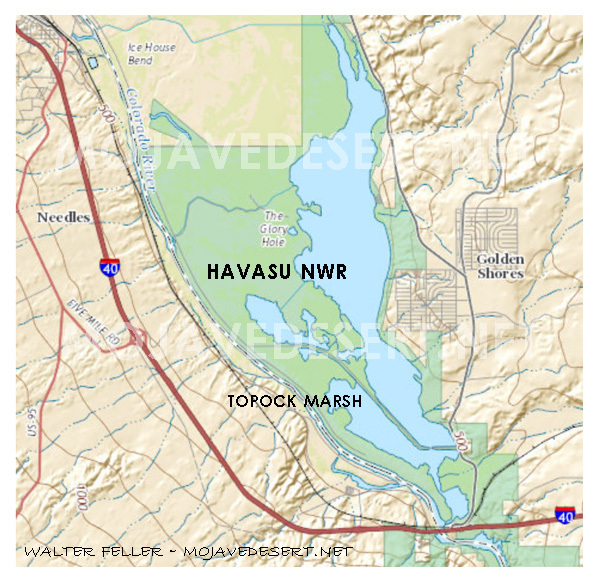 In October 2008, an act of arson created the Sacramento Wash Fire which burned 306 acres including approximately 240 acres of dense tamarisk (Tamarisk ramosissima and T. aphylla) growing on the alluvial fan deposits where the Sacramento Wash terminates at the southern end of Topock Marsh. The fire also consumed approximately 41 acres of emergent wetland vegetation, including cattails (Typha domengensis), bulrush (Schoenoplectus sp. ), and spikerush (Eleocharis sp). The remaining land cover classes affected by the fire were characterized as either developed, mixed shrub-scrub, or open water. To rehabilitate this area, a revegetation plan concentrated on the 240-acre area previously dominated by tamarisk. This area was divided into management zones based upon results from soils data analysis and mapping. These management zones were then prioritized for revegetation based upon proximity to available water. Water availability was considered important because the soils data indicated very high soil salinity levels that required mitigation (i.e., leaching) prior to planting native vegetation. It was eventually determined that revegetation priority should be located close to the county road (i.e., higher public visibility) and that it would be worth investing in a new groundwater well to improve potential for revegetation success. The management zone closer to Topock Marsh would still be revegetated, but without the benefit of irrigation water. The 22-acre Irrigated Revegetation Area contained extensive log and woody debris piles, as well as very uneven terrain. It was necessary, therefore, to subcontract a heavy equipment operator to address these issues prior to installing the irrigation system. Financial resources were requested in winter 2011 to enable hiring a qualified logging contractor to complete treatments of the log and woody debris piles spread across the Sacramento Wash project area. In the spring of 2011 the planting of native tree and scrub species such as mesquite (western honey and screwbean), blue palo verde, desert broom (Baccharis sarothroides), Seeding saltbush (quailbush and 4-wing saltbush) began. Additionally native grass species such as (needle grama, alkali sacaton, James’ galleta), and native herbs (desert globemallow) were included in the effort.